The Tarot Deck for KULT: Divinity Lost consists of 68 cards, rich in symbolism and designed specifically for the KULT mythos. The deck is used by the gamemaster to - through readings - create plots, antagonist, locations, and allies for when planning a campaign. It can also be used in-game when introducing new locations and characters in the heat of the moment. 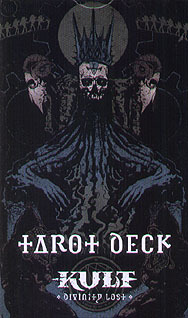 The Tarot Deck is recommended for use with the Taroticum scenario from the book Taroticum and Other Tales.